The Escarpe feels solid and confidence inspiring, if hard to manual! Fondly remembered for its lugged aluminium cyclo-cross bikes from the Eighties, Vitus is back with a contemporary range of mountain bikes. Top of the travel tree is the 140mm Escarpe 1. Sporting a genuine four-bar suspension design, the Escarpe frame shares a very similar layout to Norco’s Sight 3. Both bikes also have rocker-link pivots hydroformed into the seat tube, but the Vitus gets two separate link plates with a small stiffening bolt, instead of the one-piece welded affair found on the Norco. Still, we had no complaints about frame stiffness with beefy box-section chainstays and a solid, one-piece chainstay yoke. Rear end stiffness is further enhanced by the 142x12mm bolt-through dropouts. Up front the double-kinked down tube offers plenty of room for a full-size water bottle and there’s something refreshing about the more traditional straight top tube and seam-welded monocoque support at the seat tube junction to keep the standover height nice and low. Cable routing needs sorting, though, as all three rub on the fork crown. Even though the Vitus frame sports the latest tapered head tube, the Revelation fork gets a straight 1 1/8in steerer tube. OK, it’s another case of penny-pinching, but a lesser evil than the 9mm QR fork lowers adorning Lapierre’s similarly priced Zesty 214. It felt smoother than the fork on the Lapierre too, even if the internals are the same. 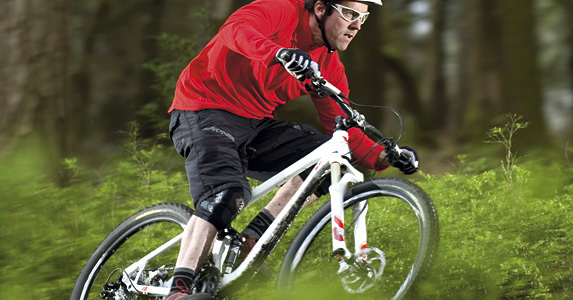 Keeping it RockShox front and back, the Monarch RT shock gets external rebound and Floodgate compression adjustment. Given that we ran both adjusters full open, you could call the shock dials decorative. Swapping the Nobby Nic tyres negatively impacted the Escarpe’s straight-line rolling speed, but it benefited handling by slowing down the steering response. Power delivery to the rear is almost instantaneous with the freehub on the Fulcrum wheelset engaging twice as fast as the others on test. The action of the SRAM X9 shifters is heavier than the Shimano SLX set-up on the Norco, but it also has a more positive, defined shift. For once we had no bleed issues with the Avid Elixir 3 brakes, but the rear hose did come with the wrong caliper connecter so we zip-tied it to the seatstay. Matching Truvativ Stylo T30 finishing kit ensures that the Vitus is well turned out. OK, the bar has a slightly goofy profile and the 27.2mm seatpost shimmed up to fit the 31.6mm seat tube isn’t ideal, but the bar is wide enough and the shim makes it really easy to adjust the saddle height. After a few longer rides, the rear end on the Vitus started to loosen up due to the shock eyelet bushings bedding in but it wasn’t enough for us to run the shock dials at any position other than fully open. It’s not that the rear suspension wasn’t doing its job. On the contrary, the bike is actually very effective on the mid-size and bigger hits. Why else would it be so quiet, even though it wasn’t sporting a chainstay protector? Our gripe was more about the lack of sensitivity and its sluggish response, both of which make the Vitus ride heavier than its weight suggests. Granted, less experienced riders may find the inherent stability reassuring, but the flipside is that, combined with the relatively long chainstays, the overly damped shock makes it incredibly hard to lift the front or preload the suspension to get the bike airborne. On the plus side, it does make the Vitus pedal really efficiently! 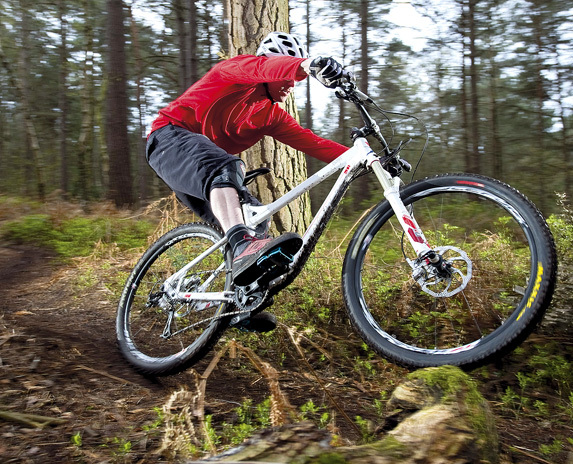 Vitus has definitely hit the ground running with the Escarpe 1. The spec is impressive, the geometry is good and the bike feels reassuring solid even thought it’s the second lightest in the test. Yet something about the balance of the Escarpe isn’t quite right. The combination of the relatively long chainstays and the over-damped shock pushes too much rider weight onto the front end of the bike, making it less maneuverable and lively than it should be. Still, being £150 cheaper than the Kona or the Norco, you’ll have plenty of change for a shock re-tune, should you feel the need.